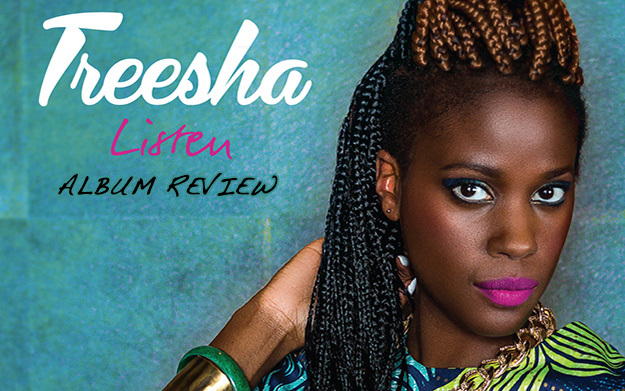 From background to spotlight: with Listen, Treesha presents her first solo studio-album. The singer with Kenyan roots who is known for her unfaltering support of Gentleman's performances now shows what she's got in store for us. The release under the wings of Kskamp Intl./ Undisputed Records can clearly be considered Reggae; however, it leans heavily towards R&B and pop as well. Most of the 15 songs included circle around relationships and the big four-letter-word. While Listen, Break My Heart or Tomorrow reflect on the more painful instances of heart-ache and frustration, Don't Run Away, Give It To Me and Love Letter celebrate the sunny side of love, as does the fine Skarra Mucci collaboration Love You Like 123. We Need Love featuring Denham Smith, has a more global appeal. Treesha's singing qualities come to the fore here - both the high and the low notes are skilfully hit. It is actually a shortcoming of the release that some of the tracks are far too computerized (Let Me Know, for instance, or Got You) to really be proper company for her formidable voice. These soft but powerful vocals deserve organic, live instrumentation! As in I'm A Lion – here, the driving drums and percussions accompany Treesha in just the right way. But, shouldn't it be I'm A Lioness? The lyrics are on the whole quite plain and straightforward - while Treesha's vocals are unequalled, the songwriting has room for improvement, at least when it comes to lyricism. Probably best known to the public so far is the single Don't Do It on the Retro Locks Riddim, which is already up and running in the dancehalls. Besides this one, Down 2 Music Lane is, in my opinion, the strongest track of the release, a fact that can be attributed to the wonderful underlying riddim. Skank it! Listen is a valuable addition to the shelves of any reggae collector, and hopefully we will hear more of this talented young lady soon. And who knows, maybe one day we'll read tour posters saying: TREESHA (live) featuring Gentleman?